Today's Heartbreakingly Great Name is close to my heart as I live in Lawrence, KS home of the Jayhawk. Jayhawk's real name is Claude and so I picture him playing catch with a Bertie Wooster and Jay Gatsby. Jayhawk was a member of the Twins when he was selected by the Rockies in the Expansion Draft. 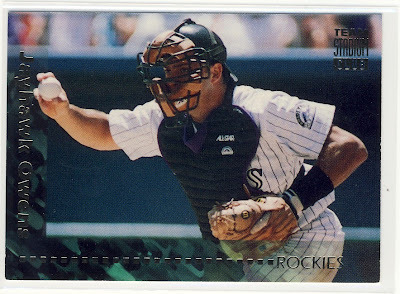 He would end up playing four seasons for the Rockies as a catcher.